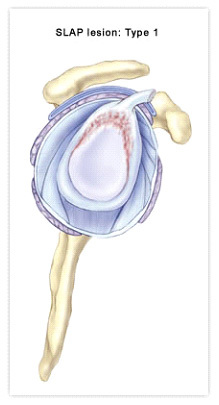 Patients with glenoid labrum injuries present with non-specific shoulder pain that is associated with activity. External rotation and horizontal adduction are generally painful, and a click or pop may be felt with manipulation. Often there is associated weakness of the rotator cuff muscles. A very common labral injury is a tear that occurs on the top of the labrum, extending from the front to the back of the cartilage. This is known as a SLAP tear ("SLAP" is an acronym for superior labral anterior to posterior tear). This injury affects the attachment of the biceps tendon to the glenoid. An injury in this area can be extremely painful, and can cause the biceps tendon to rupture. Immobilising with arm in sling day and night. (The sling should be secured to the upper body with a safety pen or use a special sling). Swinging exercises at a minimum of 3 times a day. Elbow and wrist does a full active range of motion (AROM) minimum 4 times a day. Immobilising in the sling during the night. Remove the sling during the day and start physiotherapy. Manual resistant movement in the scapula. External rotation, internal rotation and biceps curl. Careful exercises both active and passive for the shoulder. Positive body awareness training (shoulders back and the chest forward). NB! Avoid pressure on the suture and the sutured tissue. Immobilising in the sling is not necessary. Can be used if you need it. Joint mobilising for scapula and glenohumoral mobility. Careful exercises for the rotator cuff and the scapula stabiliser. Increase the AROM, emphasise the humeroscapular rhythm. Functional training: muscular control and proprioceptive exercises. Specific training with consideration to rehabilitation according to type of work or sport. Goal: Full active range of motion.